Glenn Irwin set the pace during opening practice at the Macau Grand Prix. Glenn Irwin topped the opening practice session for the 51st Macau Motorcycle Grand Prix after knocking eight-time winner Michael Rutter off the top spot with his final flying lap. The Carrick man, who only made his debut at the event in the Far East last year, led the session on the PBM Be Wiser Ducati until around seven minutes from the end, when Rutter took over on his SMT Bathams BMW. Carrick man Glenn Irwin is making his second appearance at the Macau Grand Prix. However, as the clock ticked down, Irwin upped the ante and put in a flying lap in 2m 26.022s on the Panigale to head the time sheets. Rutter was 1.4 seconds behind in second place, with Austrian rider Horst Saiger slotting into third, a further second in arrears. 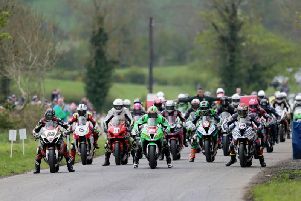 Derek Sheils impressed with the fourth fastest time on the Cookstown B.E. Racing Suzuki. The Dublin rider is also making his second appearance at Macau after finishing ninth on his debut in 2016 for John Burrows’ Dungannon-based team. Sheils’ time of 2m 29.522s was 3.5 seconds down on pacesetter Irwin. Manx rider Dan Kneen was fifth quickest on the Penz13.com BMW ahead of Martin Jessopp (Riders Motorcycles BMW), who has finished as the runner-up three times at the event. Peter Hickman, who has won the race for the past two years, was seventh on the SMT Bathams BMW, 3.9 seconds behind North West 200 Superbike winner Irwin. The Isle of Man’s Conor Cummins completed the top eight on the Padgett’s Honda ahead of Ivan Lintin and Gary Johnson. Fermanagh’s Lee Johnston was 18th, with Michael Sweeney from Skerries 21st ahead of fellow Republic of Ireland rider Steve Heneghan. Davy Morgan from Saintfield was 27th. The race is scheduled for 07:40 GMT on Saturday over 12 laps of the 3.8-mile Guia street course.